The United States contains 5% of the world’s population, yet consumes about a quarter of the planet’s resources. Much of this consumption stems from our “throw away” lifestyle, whereby many products are used once and then thrown away. This started in the 1950s, when the plastics and chemical industries sold the American public on the convenience of single-use disposable items. In 2011, the average American produced 4.4 pounds of household garbage per day, twice as much as in 1960. Today, the throw away lifestyle has big upstream and downstream impacts on climate change, community health, and the state of our oceans. This is the first in a blog series from Clean Water Action's ReThink Disposable program called “Let’s Unpack That.” The goal: to take a closer look at aspects of the throw away lifestyle, and offer alternatives. For our first post, we wanted to pick something that many Americans rely on to start their day: coffee. How often does this happen to you—you go to a coffee shop in a rush and next thing you know, you are walking out with a plastic-lined paper cup, a paper sleeve, a plastic lid and a plastic plug to prevent spillage. Coffee shops are ubiquitous in the Bay Area. People are opinionated about coffee, and are willing to spend a lot on the perfect cup. In addition to the major chains like Starbucks and Peets, we have a significant (and ever-growing) number of local cafes and local chains, each with their own following. Though a big part of coffee culture is the dedication and thoughtfulness that goes into each aspect of growing, roasting, brewing, and serving, the packaging of the finished product is out of step with the care and thoughtfulness on which coffee purveyors pride themselves. 1. Businesses use their cups as a form of branding. 4. It is inconvenient to carry a refillable mug. Unfortunately, to-go packaging for coffee has a huge ecological footprint. Making plastic lined paper coffee cups is energy and resource intensive. Eighty percent of the pollution happens upstream during the extraction and manufacturing phase of the product’s life-cycle before it even reaches a consumer’s hands. Transporting used cups to a landfill or recycling facility is energy intensive and, because of their plastic lining, cups in a landfill take hundreds of years to break down. To make matters worse, Greenhouse gas release from landfills is a major contributor to global warming. Cups and the associated packaging for to-go beverages make up a significant portion of litter that clogs our waterways when they escape the waste management system and end up in the environment. 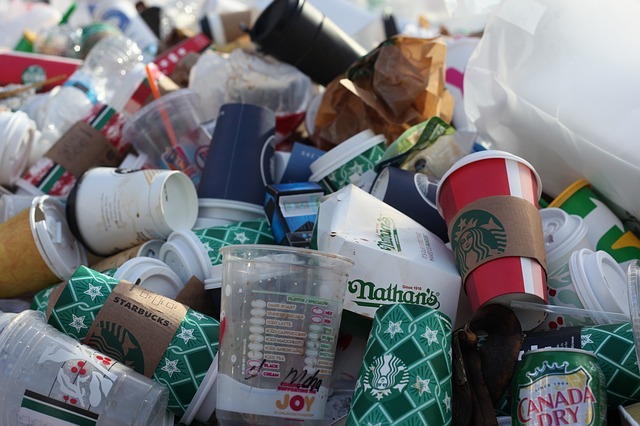 Starbucks alone produces 4 billion disposable cups each year. Thankfully, reusables are a genuinely good alternative: according to one estimate, one only needs to use a ceramic mug about 18 times to break even with a paper cup in terms of water use, energy and waste. We know that coffee shops that focus on reusables can make a big difference in trash production. Take The Conservatory, a bustling coffee and bagel shop in Culver City. After working with the ReThink Disposable program, they made a dramatic shift toward reusables that included prioritizing reusables for on-site dining and advertising a “Bring Your Own Cup” incentive of 10 cents for to-go orders. As a result of their changes, The Conservatory now prevents 205,008 disposable foodware items, reduces annual waste by 2,118 pounds, and saves close to $7,000 every year. In a place where people are fanatical about their coffee, choosing not just to forgo disposables for oneself, but to encourage one’s preferred coffee provider to shift toward reusables for onsite consumption is a choice that can have a ripple impact on local and global waste production and plastic pollution.